Shipping your products couldn’t be easier. No matter what you sell or where you sell, Stamps.com has the features you need for simple, seamless and cost-effective shipping. Customers sometimes confuse postage charges with shipping & handling charges. That’s why Stamps.com’s Hidden Postage feature is so valuable. The Hidden Postage feature allows you to print shipping labels without showing the value of the postage paid. With Hidden Postage, you can charge a fair shipping & handling fee without customer questions or complaints. Read more about Hidden Postage. Keep your customers in the loop and off the phone with Stamps.com’s email notification feature. Your customers will be immediately alerted when their package has shipped and is on its way. Our email notifications even include a link to online package status information so your customers know where their package is at all times – without having to call you. Make your fulfillment process a lot easier with an itemized packing slip for each package. It not only streamlines your shipping process but also gives your customers an itemized list to check against the contents of their package. For added convenience, you can print packing slips separately on plain paper or on the same sheet as your shipping label. Make sure your mail arrives at the right destination! 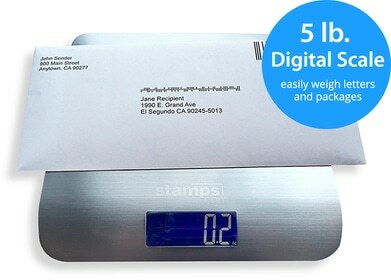 Each address printed using Stamps.com goes through the USPS® Address Matching System, an up-to-date database that verifies valid mailing addresses in the United States. Address verification improves the accuracy and timely delivery of your mailings. Make life easier for your customers and for you. At your request, Stamps.com will email your customers a return shipping label for any package sent with either Delivery or Signature Confirmation.™ The label is pre-addressed and includes postage paid from your account (refundable if label is not used). Best of all, the label can be printed from any web browser.